Gear Shift Plate Screws & Nylock Nuts - Set of 4 ea. 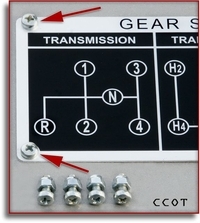 Gear Shift Plate Screw Kit. Original style Phillips pan head screws with tiny Nylock nuts make a perfect solution to securely attach your Gear Shift Placard to your glove box door. The Phillips head screw was used by Toyota to attach the gear shift plate on 9/'73 and earlier models before Toyota went to rivets. So, if you don't have a rivet gun, or you prefer screws over rivets, then this screw kit may be the perfect solution. NEW! Another CCOT Exclusive Part! Original Style 4-Speed Gear Shift Instruction Placard. 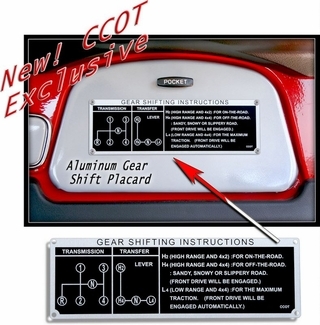 These high quality placards are screen printed (thermal-bonded) on anodized aluminum to have the same look as the original gear shift instruction plate. This is an original style 4-Speed aluminum plckard with corner rivet attachment holes (9/64") that allow new plate to mount just like the original on the front face of the glove box door. Color - Black & Silver - Rivets not included. Original Style 3-Speed Gear Shift Instruction Placard. Fits Production Dates 9/'71 to 9/'73. This is an original style 3-Speed aluminum plckard with corner screw attachment holes that allow new plate to mount just like the original on the front face of the glove box door. Color - Black & Silver - Screws not included.